Primary Microscience – integrated science resources for primary school learners. 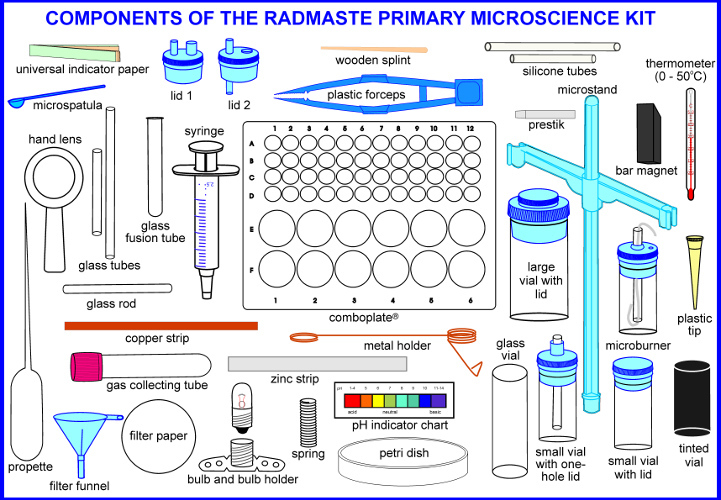 Secondary School Microscience – resources required for both junior secondary and senior secondary school practical science. 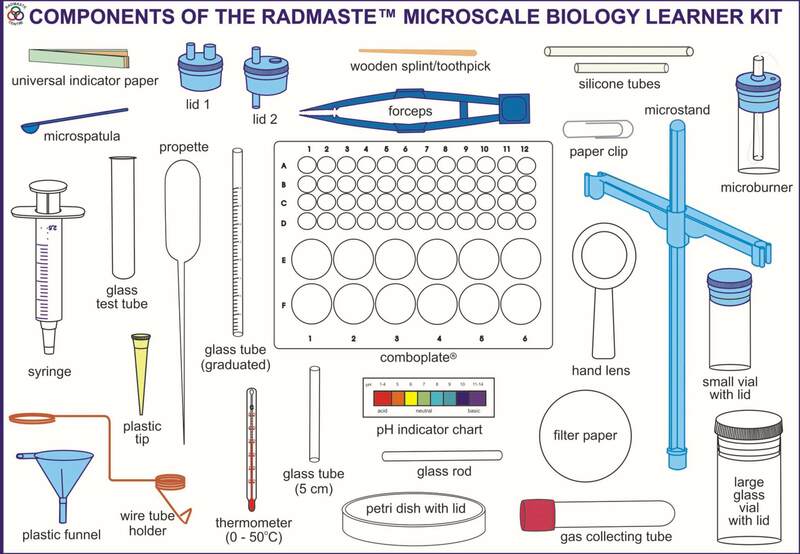 Resources Supporting Microscience – conventional equipment needed to support the microscale kits, as well as Microchemicals kits and Microscience activity lists available for use with the kits. Extra-curricular Microscience – details on two Microscience packages that can be used for learning of science outside the classroom (such as in science clubs, on field trips and at expos). Simply hover over the images below to learn a few quick facts about the featured kits. For more information, download the Catalogue. 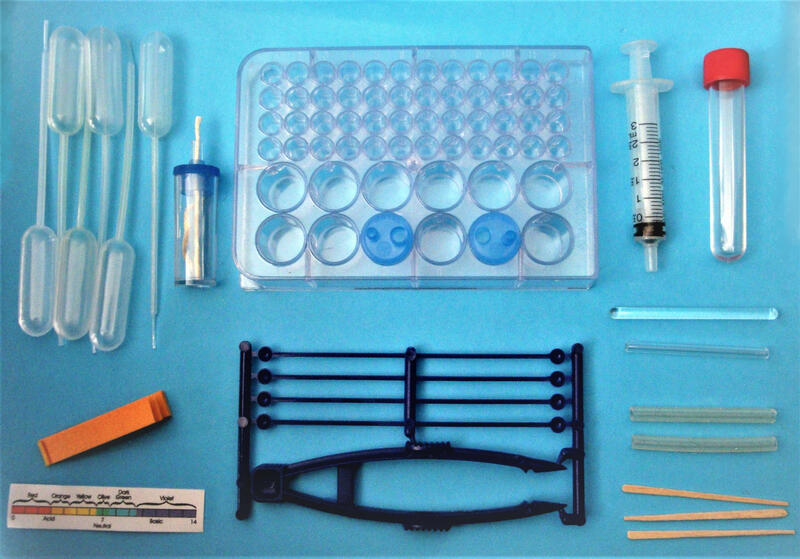 This kit contains small-scale components for carrying out a wide range of core chemistry activities at low cost. Can be used at both junior secondary (GET) and senior secondary (FET) levels. Can be used by individual learners or groups of learners. No laboratory or special set-up required! 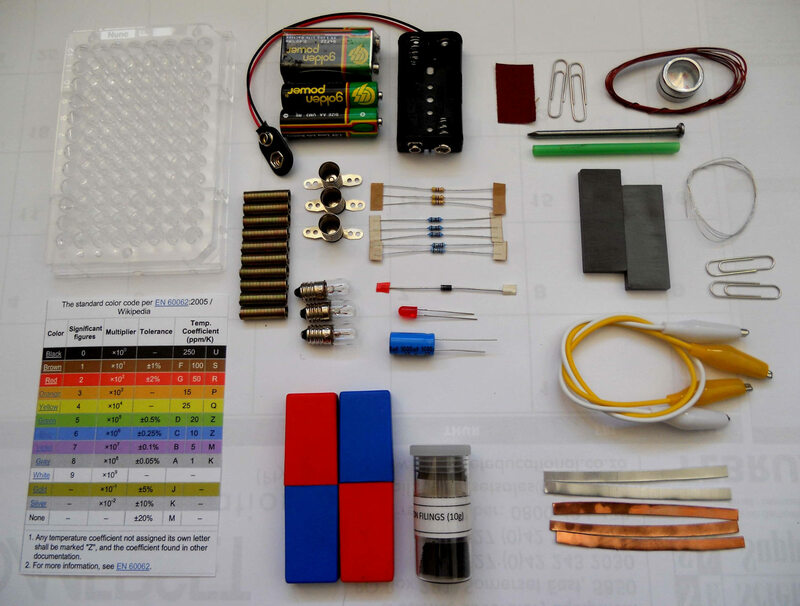 This kit contains extra pieces of equipment so that learners can complete all core activities usually done with the Basic Microchemistry Kit, as well as additional experiments such as collection and testing of gases, simple conductivity testing, electrochemistry etc. Optional for the junior secondary (GET) level but ESSENTIAL for senior secondary (FET) chemistry. This kit uses a microwell plate as the basis for the setting up of electrical circuits. 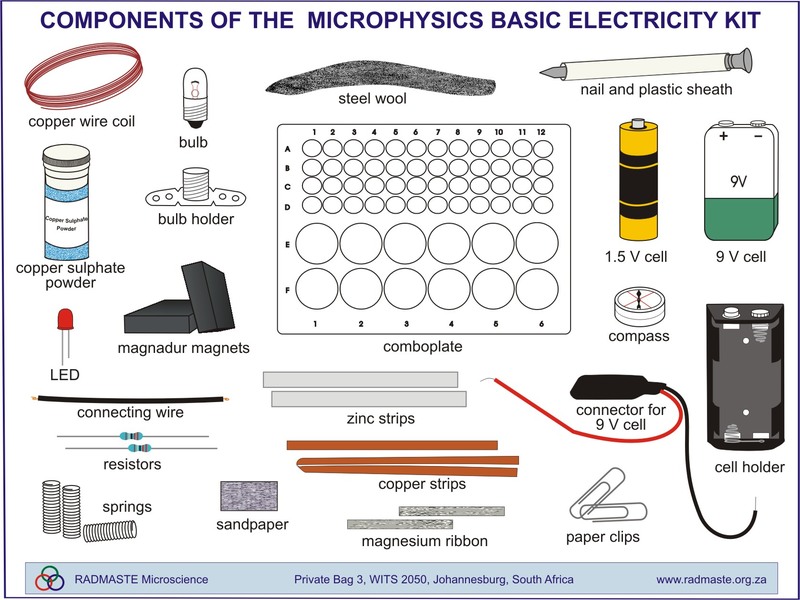 A variety of small-scale components allow for activities falling under the topics of current electricity, magnetism, electromagnetism & electromagnetic induction. A group of four secondary school learners needs only one kit and two multimeters to complete many electricity activities. No laboratory or mains electricity required! 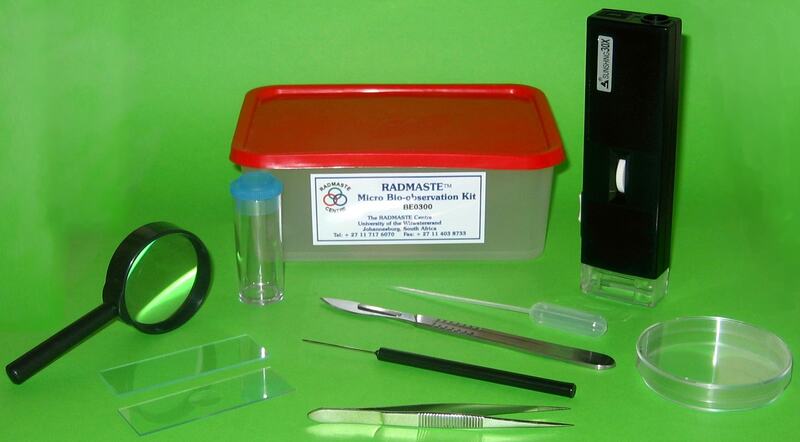 RADMASTE recommends this kit for senior secondary (FET) electricity experiments under the theme of Electricity and Magnetism. Using this kit with supporting worksheets and multimeters, learners will encounter circuits and circuit components in a much more interactive way whilst learning about current, voltage and resistance. This Kit enables learners to study biological specimens they have collected from their natural surroundings. There are several observational tools including a unique handheld microscope which can be used outdoors. Microscope slides and dissection apparatus are managed by the teacher which means this kit can be used from primary school right up to senior secondary level and beyond. An essential kit for the senior secondary (FET) life sciences/biology classroom. Small-scale activities using this kit cover enzymes, biological molecules (carbohydrates, proteins, lipids, etc), respiration, photosynthesis, water relations in plants, and more. Supported by a biology chemicals kit and a biology teacher resource kit to extend its versatility. 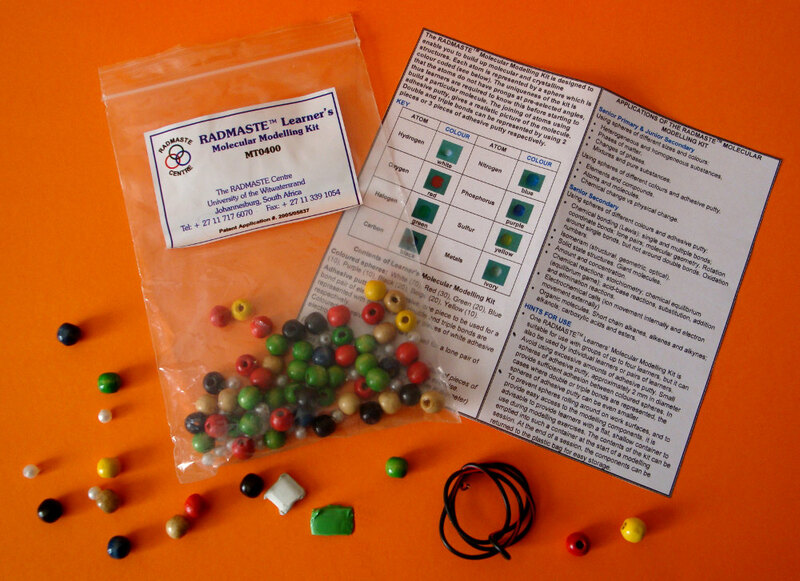 This Kit has been specially designed for primary school learners (grades 4 to 7 in South Africa). One kit does it all - chemistry, physics and biology! Activities range from Junior Primary (e.g. air, water, soil) to more advanced Senior Primary (heating and heat transfer, the three states of water, matter and measurement, electricity, magnetism, food, etc). An essential kit for learners of ANY age, but specifically relevant to primary school learners who are being introduced to the Particle Model. Learners can easily build 3D models of molecular and crystalline structures using familiar materials. 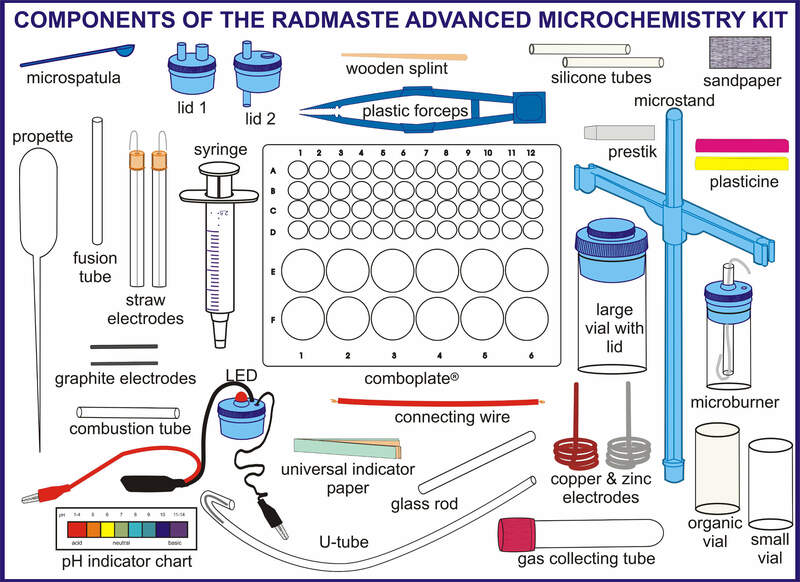 Best used together with the RADMASTE™ molecular stencils for 2D visualisation.